Not having much experience in the cooking arena, I have been spending some of my free time taking classes to improve my skills. LivingSocial’s 918 F Street has held a few, and I’ve been attending as many as I can. 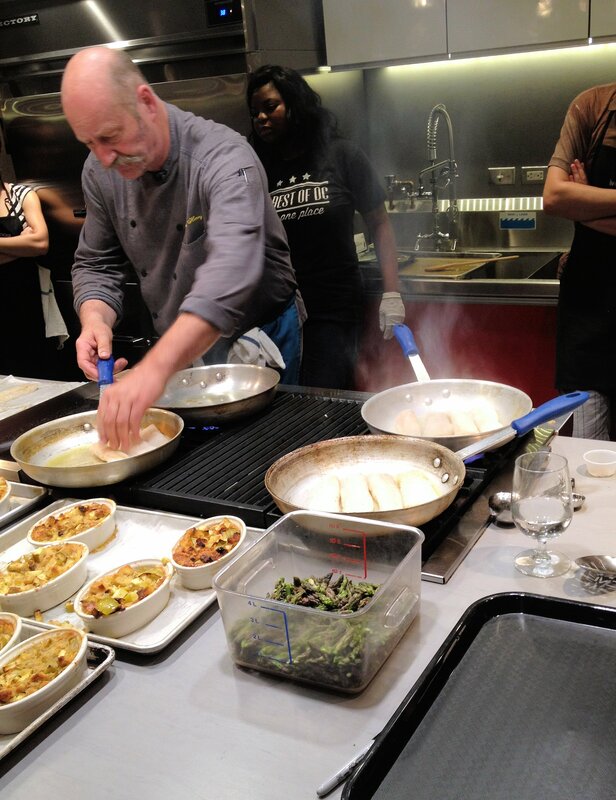 On 27 May, I went to a French cooking class at 918 F Street taught by Chef Bernard Henry. French food sort of intimidated me – I was expecting it to be fairly difficult – but I was surprised at how easy our dishes were to make. 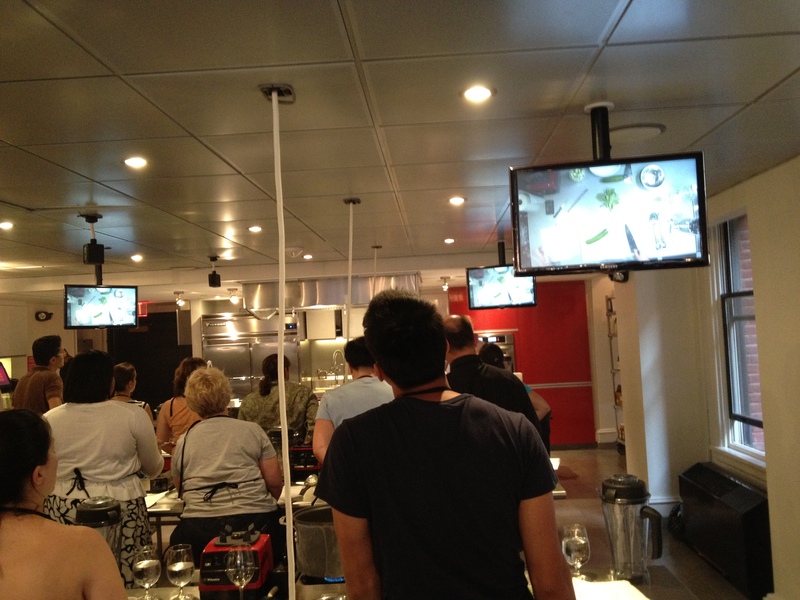 LivingSocial has a great setup for their cooking classes. There is plenty of space for each group of two to get their cooking on, and you generally end up making enough food for dinner, as well as lunch the next day. Everyone generally has a partner, which tends to remove some of the intimidation factor for those who don’t cook very often. All of the ingredients are pre-measured by the kitchen team, and there are plenty of LivingSocial staff members available to assist in answering any questions or providing spare kitchen implements or ingredients. 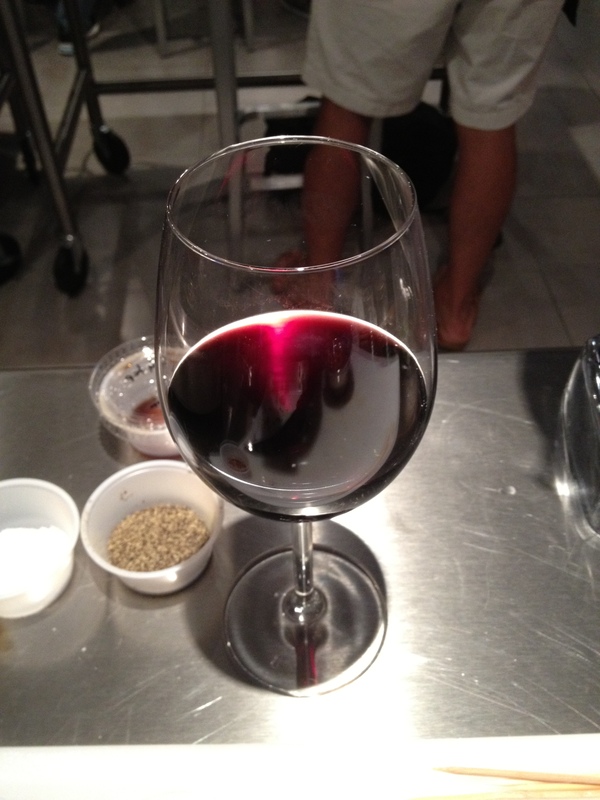 Besides all that, either beer, wine, or cocktails are provided while cooking and eating (depending on the cuisine). Additional drinks from the 918 F Street bar, staffed by Jon Arroyo‘s mixologists, are available for a fee (they’re good, so I’d recommend you try them). The classes seem to be about 50/50 males and females, singles and couples…the courses are perfect for a date, and if you’re single they could be good opportunities to meet your future ex. 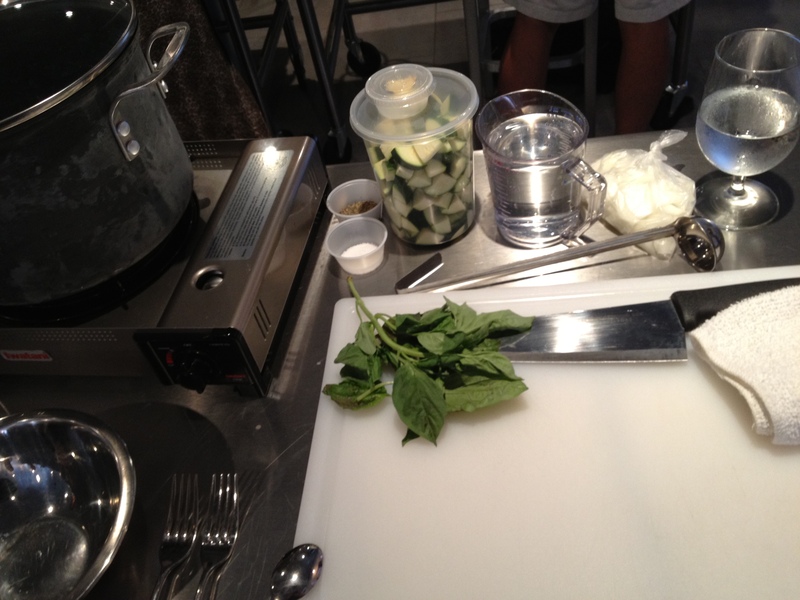 During this class, we learned to make Zucchini-Basil Soup. Really tasty hot (as we made it in the class), but it would be a great summer-time soup when cold. 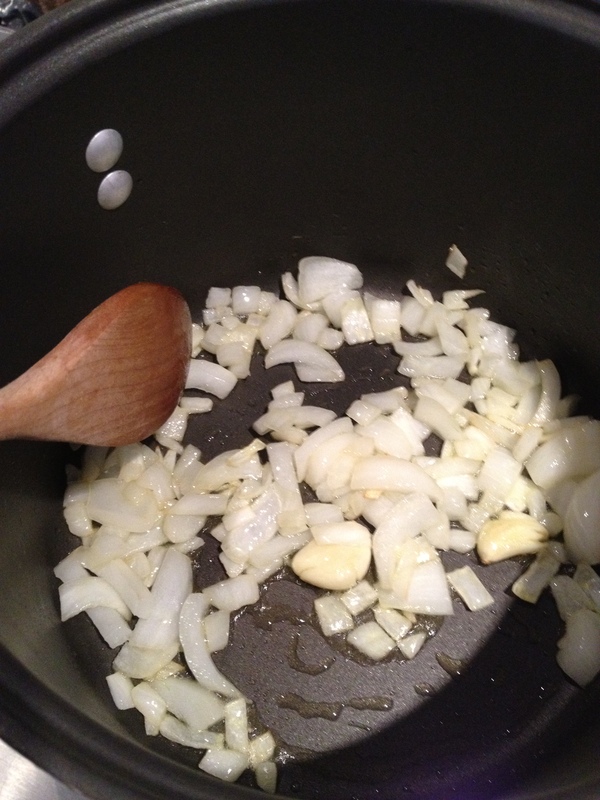 Again – it was so easy to make…after cooking onion, garlic, and zucchini in a saucepan for a short time, everything goes into the blender to be puréed. 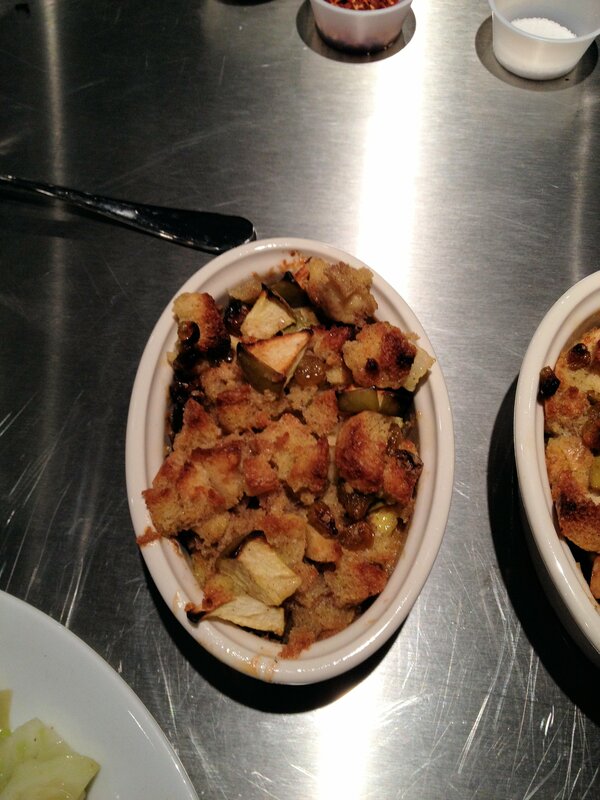 …and the finished product. 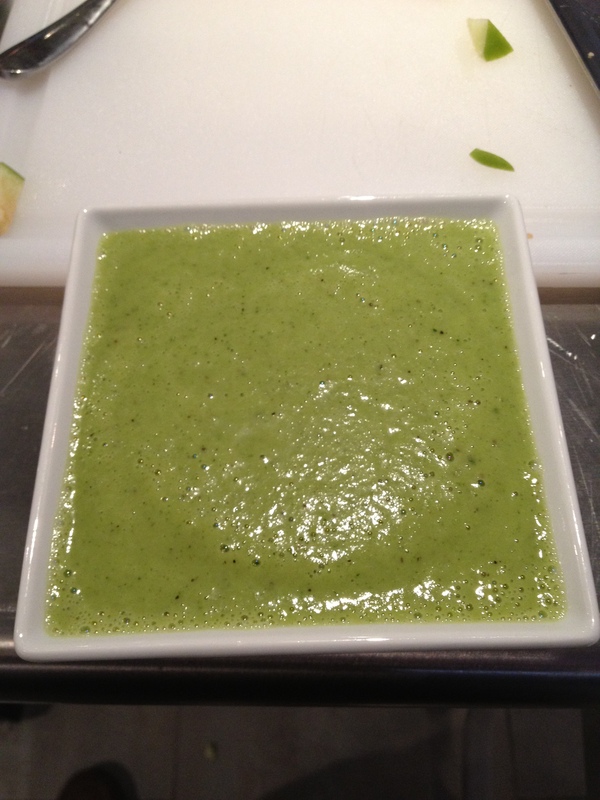 Tasty Zucchini-Basil Soup. 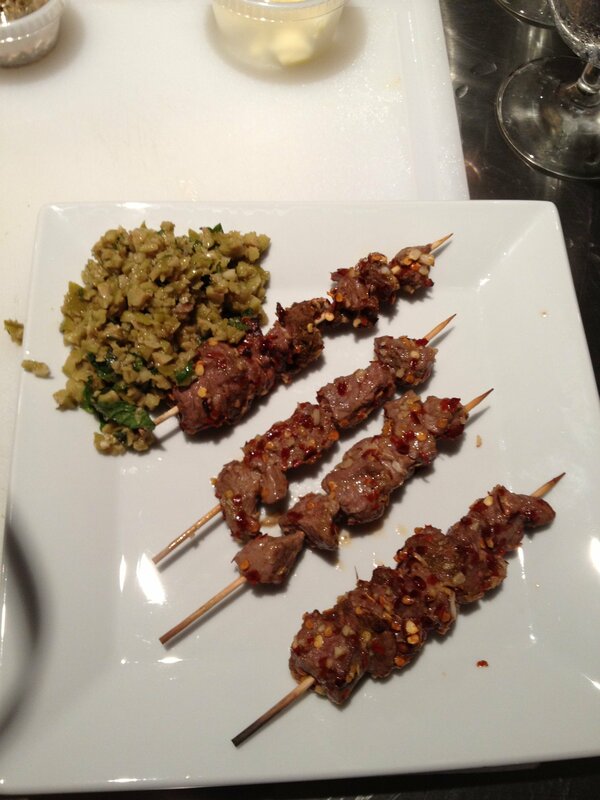 We also made lamb skewers with a green olive and mint tapenade…so good, and again, really easy to make. 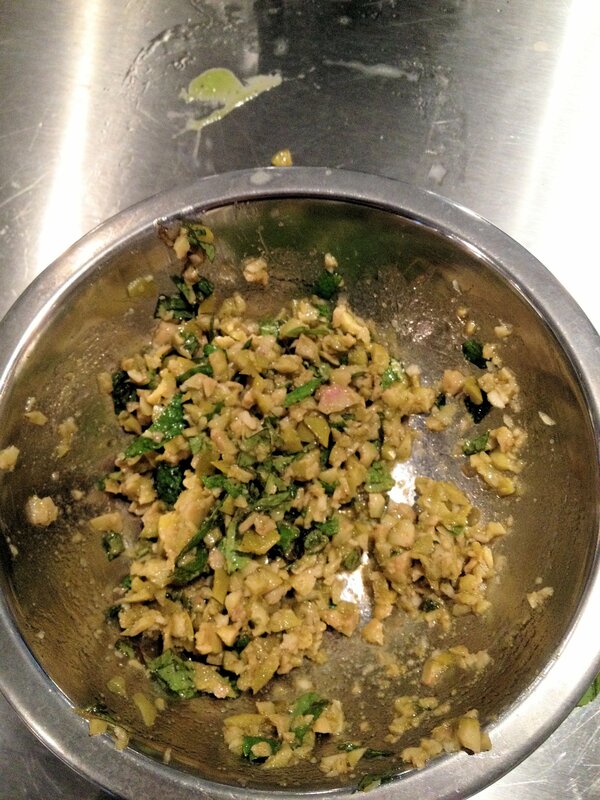 I could eat the tapanade by itself…it was that good. 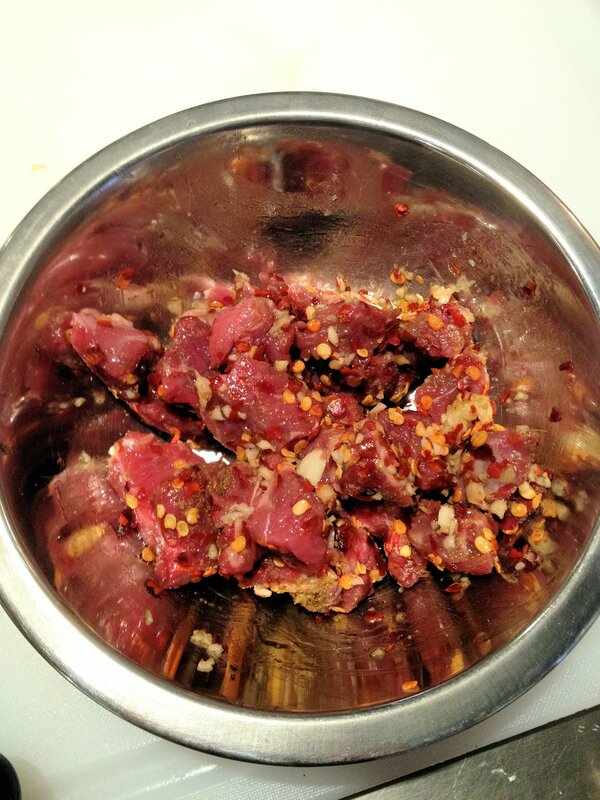 The lamb skewers plated. They came out medium rare, and were excellent. 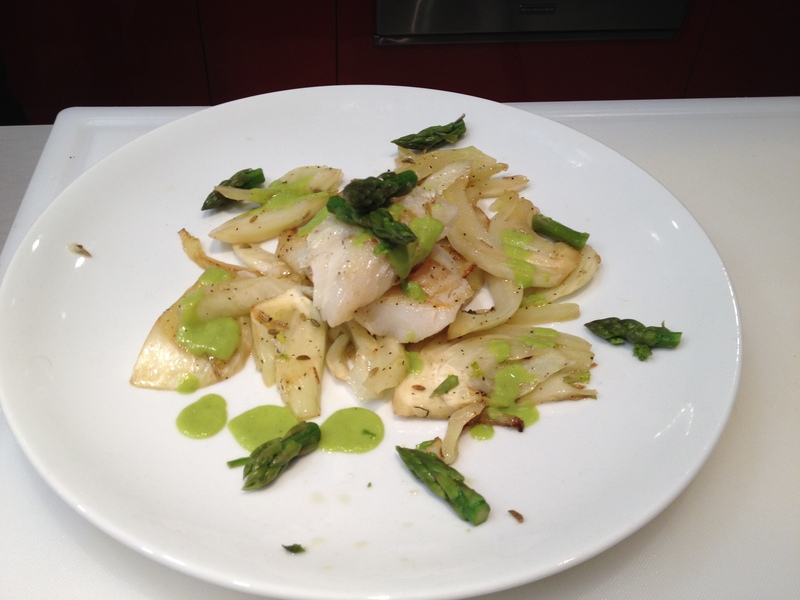 Entree number two was was sautéed cod with asparagus sauce and fennel. 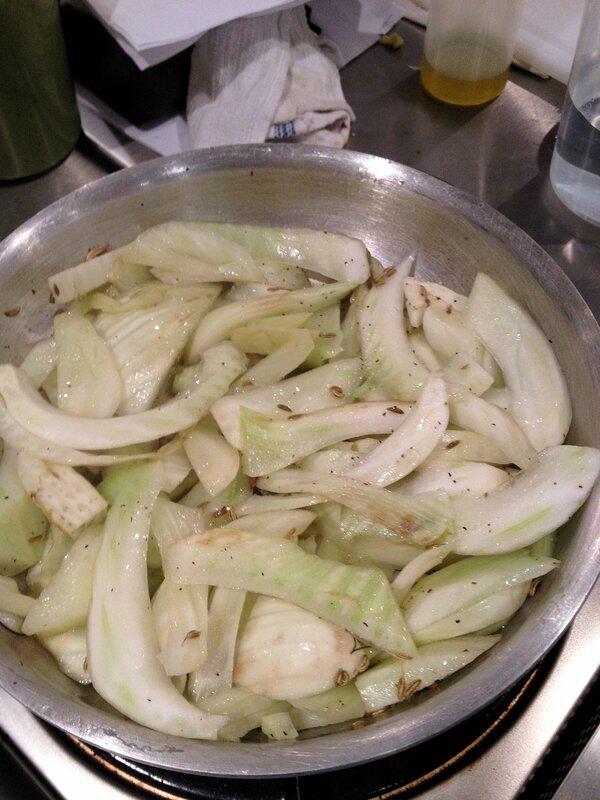 I don’t think I was a fan of fennel until I cooked my own…it goes very well with non-oily white fish. For dessert we cooked up some rum raisin bread putting (from what I’ve learned at these cooking classes, dessert is what you make first, as they generally take longer to cook. This one took 30-40 minutes to bake in the oven, for example). I actually forgot to put milk in this (oops), but it was still good…just a different texture (perhaps a little less flavor?) than you’d normally get. A good dessert to end our French meal. This particular class went for $79. I’d say that between the social interaction, education, and large quantity of food produced that the price was worth it..the price also seems less than some other cooking schools in the area. If you enjoy cooking, or would like to start getting into it, I’d recommend you check them out. 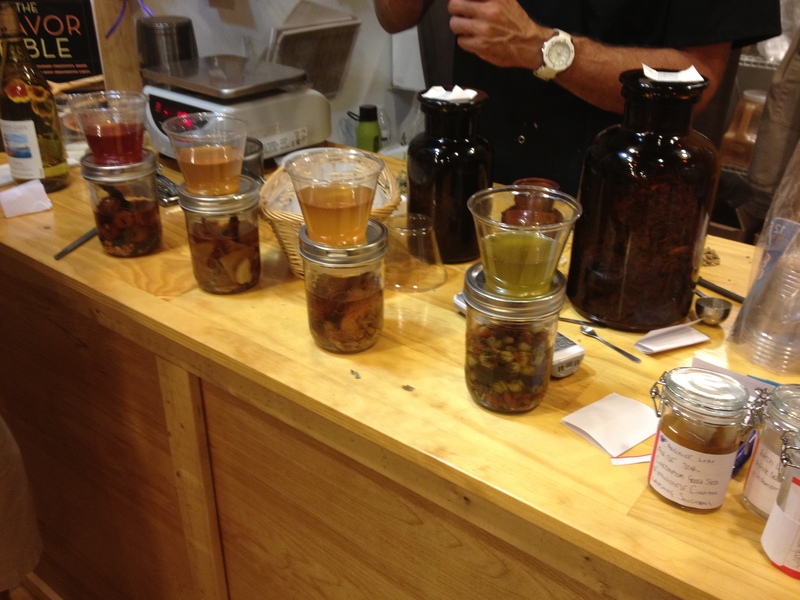 After going over some of the background behind tinctures, extracts, and bitters, teacher Jesse Dean had us put together our own mix of bitters from the stock of the Spice and Tea Exchange. The concoctions will be steeping for the next several weeks, at which point we’ll be having a cocktail night with the better mixtures. Some people may think that making bitters is too complicated for them, but it can be as easy as taking a small, sealed container of over-proof liquor, adding a small amount of fruits, herbs, or other flavorings, usually including one ingredient categorized as a bittering agent, then allowing it to steep for a couple of weeks. Make a few of these at a time and figure out which recipes work best for you. 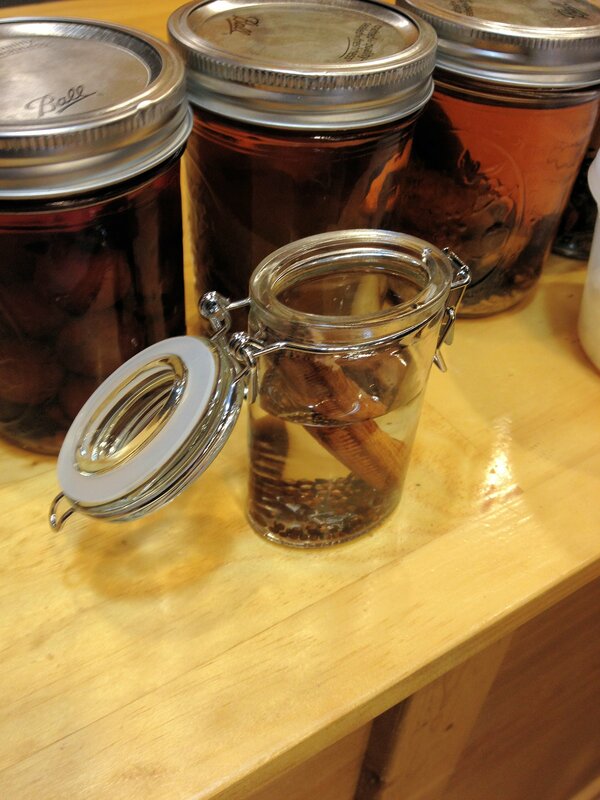 Just make sure you label the jars with what you used…that way it can be reproduced later in larger quantities. I’m going to keep the recipe for my group’s bitters under wraps for now, but it included a spice, a flower, some pepper, and a bittering agent. Cinnamon and Grains of Paradise…just to show how easy it is to develop bitters. A few varieties of bitters developed by Libations Bar School. I was a fan of the second one from the left…reminded me of allspice dram (or Christmas). I’ll provide an update when we have the cocktail night…I’m looking forward to trying out the winners.